A Bloomberg report on Friday cast new doubts on Comcast's long-gestating bid to buy Time Warner Cable. The news wire, citing anonymous sources, reported that "staff attorneys at the Justice Department's antitrust division are nearing a recommendation to block" the bid. The attorneys "could submit their review as soon as next week," Bloomberg said. Then the department's leadership will decide whether to act on the recommendation. The Justice Department declined to comment, and so did the other government agency that is reviewing the proposed merger, the Federal Communications Commission. Time Warner Cable stock, already down amid a wider market selloff on Friday, fell further when the report came out. It closed at the end of trading Friday down about 5.4%. Comcast stock was down about 2.9%. The merger of the two cable and broadband giants has promised to reshape the American media marketplace. But it has been pending for the past 15 months while regulators review the deal. In the past few months there have been growing fears, hopes and outright guesses (depending on what side you're on) that it will be blocked. Comcast (CCV) competitors and groups that oppose media consolidation have been trying to voice concerns about the merger and sow doubt about its inevitability. Meantime, supporters of the deal and investors in the companies have remained confident -- at least publicly -- that it will get the necessary go-ahead from Washington. 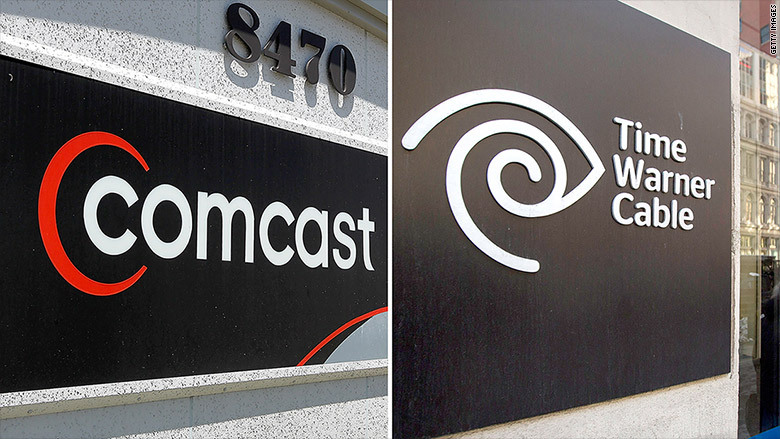 Cable executives said they have not received signals from the government that the merger is going to be scuttled. Asked about the Bloomberg report, a Time Warner Cable (TWC) spokesman said, "We've had no indication from the DoJ that this is true." DoJ is an abbreviation for the Department of Justice. "We have been working productively with both DoJ and FCC and believe that there is no basis for DoJ to block the deal," the spokesman added. A Comcast spokeswoman reiterated the company's belief that the merger "will result in significant consumer benefits -- faster broadband speeds, access to a superior video experience, and more competition in business services resulting in billions of dollars of cost savings." She added, "These benefits have been essentially unchallenged in the record - and all can be achieved without any reduction of competition. As a result, there is no basis for a lawsuit to block the transaction." Comcast is the largest cable company in the United States, serving more than 20 million households. Time Warner Cable is the second-largest.